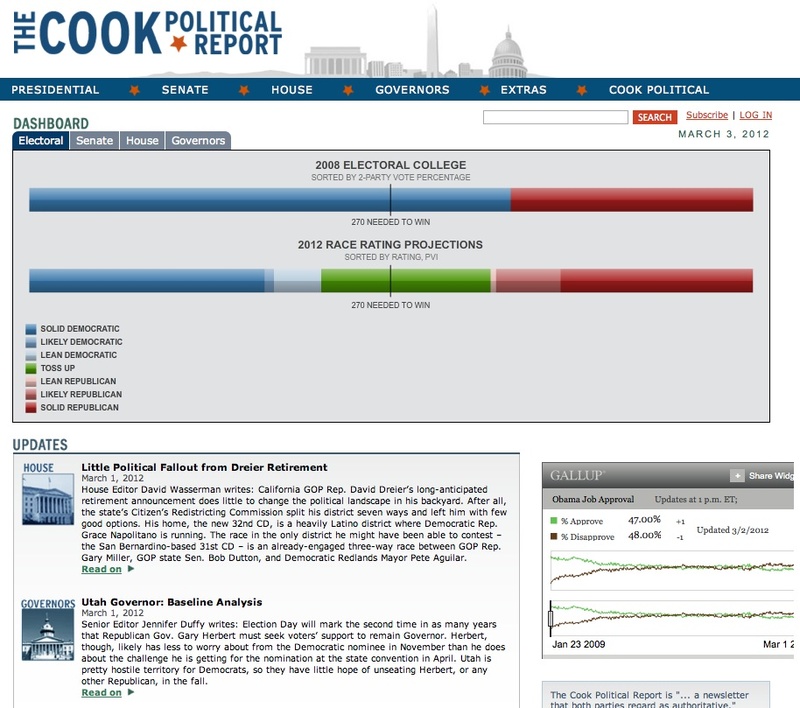 The Cook Political Report is an independent, non-partisan website that analyzes US elections, campaigns and political trends. Founded in 1984 and moved online in 2004, the Report provides an always up-to-date overview on the US political landscape since 1998, figures of every publicly available poll, and on-going narrative analysis of electoral races also rating their level of competitiveness. Managed by Charlie Cook, long-time political analyst and journalist at the National Journal, the website provides also plenty of links pointing to major national media homepages, governmental sites and a variety of other political sites. The site is divided in a series of categories/sections (such as Senate, Gubernatorial, and Presidential races, etc. ), but detailed info and data sections (mainly lists of candidates, compilations of all the related polling and in-depth analyses) are restricted to paying subscribers only. Some documents, mostly related to old electoral races or matters, can be freely downloaded in pdf format, and summaries of current postings and Cooks’ weekly column archives (back to 1998) can also be accessed for free. A simple structure and a well defined outline enables an easy navigation, with a sitemap and a keyword search option available. New items, such as notes and analyses about the US political landscape and the forthcoming elections, are freely downloadable.